Established in 1991, Bournemouth-based Modus Visual Communications, is an audio visual rental and conference production company. It hires equipment for conferences, events, exhibitions and sells into permanent installations. It is such a clever idea to use the public’s interest in fire engines to create an environment where these fire safety messages really hit home. Experiencing the cab environment and seeing the team in action has been a real hit with the public. It helps us to raise the profile and impact of our fire safety advice, which, at the end of the day, will save lives! The image quality and overall effect created by the projector is so good that this vitally important information will definitely be memorable – more than a stand or leaflet could ever be! Challenge: Dorset Fire and Rescue Service wanted to use the public’s fascination with fire engines to create powerful and memorable messages on fire safety within the cab itself. Solution: Modus Visual Communications of Bournemouth built a ‘simulator’ using an Optoma EH501 that would project an immersive video on a ‘blue light dash’ onto a bespoke screen that fits across the cab’s windscreen. With 26 fire stations across the county, Dorset Fire and Rescue Service not only responds to emergencies including fires and road traffic accidents, but also proactively promotes fire safety to prevent the causes of these incidents. As part of this preventative work, it organises fire safety sessions for the public and businesses and attends major events to educate the community in fire safety. Fire engines are always popular at these events with members of the public keen to look inside. Dorset Fire and Rescue Service wanted to use the public’s fascination with fire engines to create a more powerful and memorable message on fire safety. Modus Visual Communications of Bournemouth was commissioned to design and build a ‘simulator’ that could be experienced in the fire engine. The set-up would be used at indoor and outdoor events, sometimes in direct sunlight and inclement weather. 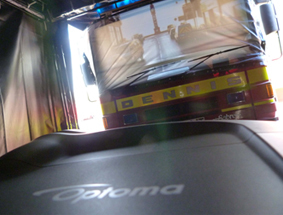 Members of the public would experience how it feels to be onboard a fire engine during a ‘blue light dash’ through busy traffic using a fully immersive video across the whole windscreen in the cab. The audience, children and adults alike, would be seated in the rear of the cab but close to the screen, so the imagery had to be a high resolution to create crystal clear content with maximum impact. The limited space inside the purpose-built black ‘projection box’ in front of the fire engine needed a projector capable of creating a bright and impressively large image even when sited very close to the rear projection screen. As the fire engines are working emergency vehicles that could be deployed at any moment, it was vital that the ‘simulator’ could be dismantled in seconds. The installation also needed to be flexible enough to fit within two different fire engines used by the service – the Scania and the Dennis. Modus Visual Communications created a bespoke black clad ‘projection box’ for the projector and control equipment, including audio. 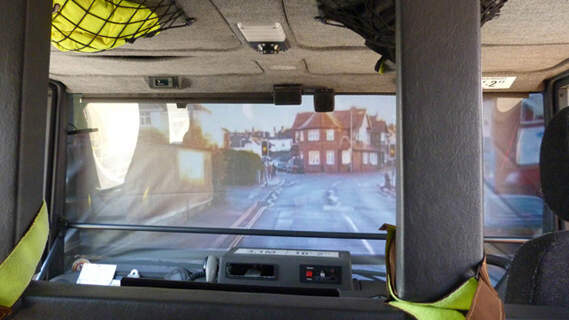 It also produced a rear projection screen which attaches to the outside of the fire engine cab to cover the windscreen. This is secured using small bungee hooks that can be removed by Firefighters in seconds if an emergency call is received. The frame of the tent-type structure can be erected by two people and the weather-resistant cladding is fastened to this framework using buckles. Content plays from a media box controlled by a remote inside the cab. 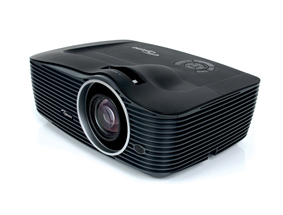 With full HD 1080p resolution and 5,000-lumens, an Optoma EH501 projector was chosen for the installation due to its brightness, image quality, reliability and its flexible throw ratio (1.37~2.05:1). 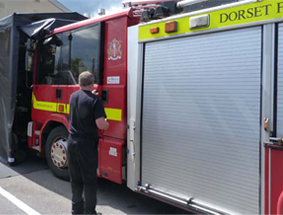 The installation went live at the Dorset Fire Service Showcase in Dorchester on 5 July 2014. The projector created pin sharp images creating an impressive, immersive and memorable experience for the public who were queuing all day to ‘ride in a fire engine’ on a ‘shout’.